The last 30 years of Monet's life were dominated by his water lilies of which he painted about 250 oil paintings. Some of the Water Lilies paintings were small, while some were large enough to take up an entire wall. With them Monet ushered in a new period of art. Claude Monet loved to garden and observe nature. At Giverny he cultivated his magnificent garden with a pond full of water lilies. Here he was able to paint nature the way he thought it should be - full of life and vibrant colors to reflect the changing light. Working in his garden, he enjoyed doing his paintings en plein air. It inspired him to do his painting outside where he could observe his subject matter as he painted because Monet simply painted what he saw. He tried to capture what people see of natural light and color and their variability. However, to do this, he needed to disregard what others said art needed to look like and create a style all his own, ignoring the principles of art defined by his predecessors. 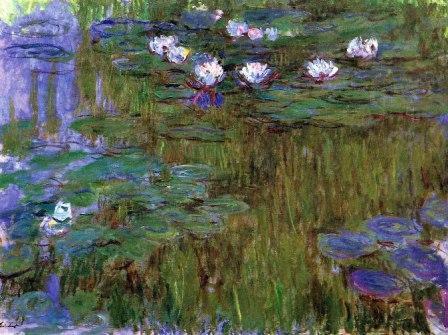 The earlier, smaller Water Lilies are characterized by attention paid to the pretty aspects of the painting, like the flowers, later downplayed by Monet. Also, in the smaller Water Lilies, Monet would do what he had frequently done before, paint a scene that is recognizably the same, but under different circumstances such as different lighting. This can be seen when comparing the various Water Lilies of 1907. In 1914, Monet began a huge undertaking that he had considered for quite some time. This was his Grandes Décorations. These giant scale oil paintings displayed his lily pond life-sized. He said the goal was "the illusion of an endless whole, of water without horizon or bank." 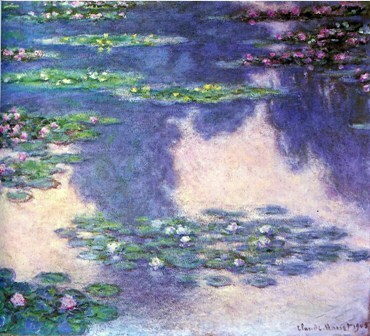 In the large scale paintings Monet shows the water lilies in a new fashion. There is a key element missing from Monet’s Water Lilies; the horizon. In paintings, particularly landscape painting, the horizon orients the viewer and defines the space, showing the spatial relationships within the composition. By taking out the horizon, Monet shows the water lilies taking up the whole of the canvas, from edge to edge. This can result in the picture appearing flat, or a tilted perspective toward the viewer. What it really accomplishes is diminishing how recognizable the scene is as a natural subject matter. Monet creates areas of color. Greens define the leaves, purples and blues the water reflecting the natural light, dark blues create shadows from the trees above, and pinks, oranges, and reds show flowers shining in sunlight. One can view Monet’s Water Lilies as starting a path towards abstraction, blurring the line between non-objective art and art showing a subject matter. Water Lilies shows colors interacting with each other, creating interest by their relationships. As with previous paintings where Monet was giving the effects of light more importance than subject matter, Water Lilies continues that and puts the interest on color. He had many ideas for how to view these works. Some, he donated to the state in celebration of the Allied victory. The end result for 22 canvases was to have two oval rooms built just for them in the Musée de l’Orangerie in Paris. Others, like the famous Water Lilies Agapanthus triptych, would be meant to viewed together. In the Agapanthus triptych, named after a type of lily, Monet wanted the 43 feet of canvas to immerse the viewer in its scene. Monet’s Water Lilies are the culmination of his life’s work. Everything Monet painted previously built up to his massive, in size and importance, paintings of the lilies he was so fond of in his own back yard.